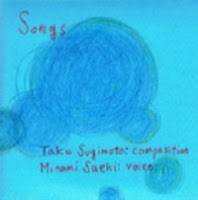 When composer and guitarist Taku Sugimoto first met vocalist Minami Saeki , he managed to sell her one of his CDs. Whenever they met next, she told him that the CD was "too difficult to fully understand". Despite this, they decided to write a few songs to go, which Sugimoto made easier to digest although, in his words, they ended up quite weird. After having the chance to perform Sugimoto's "difficult" music Saeki must have changed her mind on his music, because it wasn't long until they were planning their debut collaborative CD . The initial plans for the album were a series of vocal compositions: some for solo performance, and some for small chamber ensembles. These pieces could very easily be seen as a successor to Sugimoto's gorgeous Saritote series . They were simple, reductionist and gorgeous. They maintained strong pop sensibilities, although favoring a very modern sense of atmospheric presence to anything resembling a hook or chorus. The album's first track, Kondo-Sun, is the first track written, and the first track recorded. An album of this would have been pretty, of course, but an album of nostalgic pop songs that fall this close to previously released material is hardly what avant-garde music fans are looking for. As it often happens, when an artist settles on an idea, there's something newer and better sitting around the corner. When Sugimoto and Saeki recorded the first version of Kondo-Sun, they decided to record it in a public park. It was at this point when Sugimoto stumbled upon the idea that would make Songs so wonderful: public, outdoor recording, with portable recorders. Now, this may not sound like the most original or innovative concept , but it's Sugimoto's application which makes it so fascinating. The rest of the pieces, which comprise the majority of the 33-minute album, were composed specifically with this concept in mind. The chamber pieces were removed, and the album returned to little more than solo female voice. Some of the tracks featured Sugimoto on guitar and Wakana Ikeda  on flute, although they always place supporting roles to Saeki's soft vocal. These compositions are slow, soft and subtle, leaving plenty of room for the listener to focus on the atmosphere: the beautiful non-silence which fills the park. During some of the longer stretches of silence, it becomes easy to imagine the real-world sounds as an improvising soloist being cheered on by the rest of the band, which will surely return once they have given the soloing environment the time they deserve. Another comparison would be to the concerto: where Saeki is the soloist and the world is her orchestra. This makes me wonder, what might Sugimoto do to conduct his living orchestra? One thing that he does is explore the world surrounding the performance with his portable microphone . On tracks like a, Sugimoto walks around Saeki as she sings, his footsteps can clearly be heard shuffling through the tall grass. Her voice shifts between channels, generating a wonderful surround-sound experience which I never would have expected from the album. This seems to pay certain debts to Dancing in Tomelilla , an album which had French field recordist Éric La Casa exploring the interior and exterior of a club while a jazz group  performed inside. In the background, we hear many things: there's children playing, the sounds of the bugs and birds which fill the world, faded conversations, applause , cars driving by and even a man singing to himself. Something I adore is the large amount of time that Sugimoto has left between tracks; it seems to be just enough time to clear the previous song from your mind and prepare for the next. Saeki's voice is quite interesting. It would be very easy to refer to it as breezy, or any other air-based adjective, which, of course, fits the music quite well. That much may have been expected, but what is surprising is just how amateurish her voice sounds; I can say with confidence that she has not been classically trained . This reminds me of how amateur actors are occasionally used in art films, or how they may feel more believable in commercials; it brings a very human and very relatable aspect to the music. It's beautiful, but not pristine. It accepts the flaws of the human voice, which one might find as a metaphor for the flaws in the human soul, and finds even more beauty within them. This works exceptionally well in the opening setting, which I previously called alive. On most of the songs which features Sugimoto's guitar, he primarily bows, which is a welcome change of pace to his iconic picked style . Ikeda is featured on all of the same songs as Sugimoto, except for V, where Sugimoto is absent, and ? [sic], which is a Sugimoto solo piece. The two of them typically follow Saeki's voice quite closely, like a soft echo. On I, Sugimoto performs on a ratchet  rather than his guitar. The mechanical cranking sounds surprisingly naturally here, working as a constant source of pseudo-environmental noise to tint the canvas. Saeki is credited as performing with a wooden chair on this piece as well, in addition to her voice. This seems to be little more than some tapping and creaking. ?, the album's second penultimate track, is both prefaced and postfaced  with long pieces of faux-silence, and consists of a very brief bowed guitar improvisation : I count 6 sustained chords over a period of 40 seconds. The reason for this track's existence may have to do with the fact that it's bookended between re-recordings of the album's first two tracks, representing a break within the return to memory which may or may not represent a return to the womb where the memories of the album's simple melodies may be forgotten. When Saeki referred to Sugimoto's music as too difficult to understand, he wasn't just, slightly, offended, but he was surprised . Sugimoto hadn't thought of his music as especially sophisticated, although there's no denying their avant-garde applications. What he means to say by this is that, despite the far reaches of their experimentation, his compositions are often aesthetically beautiful, and easily digestible, and this is something especially true here. The album, very simply, sounds great. Sugimoto seems, more than ever, interested in the melodies which become immediately adored by the human ears, and in addition to that, interested in finding out just how much can be stripped from them while they continue to maintain their beauty. Songs is an album full of what are seemingly opposites: avant-garde, yet beautiful, conceptual, yet simple, minimal, yet full, composed, yet free. It's an album that can easily be enjoyed in the foreground or the background; it could fill a meditative yoga studio or be the subject of musical research. It can be easily loved by fans of avant-garde music or those just looking to bliss out. And for those wondering if a vocal album in Japanese may be hard to enjoy, as I'm sure I have very few (with that number approaching 0) Japanese readers, I can confidently say that, having heard the English lyrics of Saritote and having noticed the simple repeated phrases here, don't worry about it . The event was a screening of a film titled Village on the Village made by a friend of Sugimoto which starred Saeki, but Sugimoto failed to identify Saeki as the woman from the film. At this point I can't help but wonder what that CD might have been. This is also Minami Saeki's overall debut CD. The Saritote series comprised of 2 discs on Slub Music, which added up to little over 20 minutes of music, and one live album released by Ftarri. They were in collaboration with vocalist Moe Kamura. Manfred Werder, a collaborator of Sugimoto, has composed pieces for little more than the sounds of public parks, after all. Wakana Ikeda is the head of the Suidobashi Chamber Ensemble: a group of Japanese improvisers, including Sugimoto, who perform the music of Western avant-garde composers like Michael Pisaro and Antoine Beuger. I am unsure if this is actually Sugimoto recording, the sleeve does not state anything regarding who recorded the songs (nor does it state any personnel aside from the performers). I suspect it might be Sugimoto, however, since this seems to only happen in the tracks where he is not performing. Dancing in Tomelilla was released on frequent Sugimoto collaborator Taku Unami's Hibari Music label. Unimportantly, the recorded jazz group was called the Cool Quartet, and included Axel Dörner on trumpet and Sven-Åke Johansson on drums. I wonder if this is applause from Sugimoto and whoever might be with them, applause from on-looking strangers, or applause at something completely irrelevant. If this review is ever translated into Japanese so that Masami Saeki can read this: If you have indeed been classically trained as a vocalist, I apologize. It's worth noting that his earliest recorded document, 1994's Slub, was performed on violoncello rather than guitar. Sugimoto is no stranger to atypical instruments in his compositions; his Music for Lightsabers has a quintet of Japanese improv titans playing with toy lightsabers. I'm aware that postfaced isn't a word, but when reviewing avant-garde music, it seems fair to use avant-garde language. It is not stated anywhere that the piece is improvised, this is merely a suspicion. This is a slight exaggeration; he does make a point to say that he does understand why one might think that.